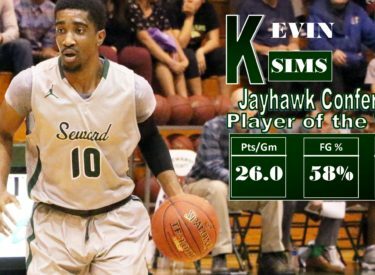 Putting on a scoring clinic in a pair of Seward games this week, Saints guard Kevin Sims has been named the Jayhawk Conference Player of the Week in a league release on Tuesday morning. Sims averaged 26 points per game this week for the Saints while shooting 58% from the field and 50% from the three point line in a pair of Seward contests. Wednesday against Cowley he put up 15 and had 3 rebounds and backed that up with a career high 37 against Coffeyville Saturday as the Saints rolled past the Red Ravens 89-82. Sims is the leading scorer in the Jayhawk Conference this season at 21.7 points per game and has already topped the 30 point mark in four different contests including Saturday night against Coffeyville. Sims and the Saints will hit the road Wednesday to take on Allen in Iola before wrapping up the first semester at home on Saturday night against Neosho County in the Greenhouse.